The WWF holds its first major event in Toronto since The Big Event in 1986. This is also the Canadian PPV debut for the WWF and WrestleMania and as such we get “O Canada” instead of “America the Beauiful.” I’m sure Robert Goulet could’ve done both if he wanted to. For the final time on PPV, it’s Gorilla Monsoon and Jesse Ventura teaming up on commentary. This is Ventura’s final PPV appearance in the WWF as a commentator, leaving to do other things like be a commentator in WCW, become a Governor, you know… stuff. The first match of the broadcast features the ongoing futility on the big stage for Koko Ware as he loses to Canada’s Rick Martel. This puts Canada at 1-0 in the Canadian WM. The end of the Colossal Connection is next with Demolition beating the team that took the WWF World Tag Team titles from them, gaining their 3rd reign. Andre the Giant never gets to legally tag in during the match and manager Bobby Heenan blames him for the loss, leading to a rather violent parting of ways. Andre and Haku will team up one last time days later in Honolulu against Demolition, come up short and fight each other, ending the tag team for good. On the upside for Andre, he’ll team up with Giant Baba in Tokyo a short time after that and get a non-title win over Ax and Smash. For Demolition, this is basically their last great moment on the big stage before everything starts to fall apart on them. Earthquake, managed by Jimmy Hart makes it 2-0 for Canada as he splats Hercules Hernandez. Well, Herc’ll always have WrestleMania V at least. A notable moment occurs in the next match as Curt Hennig aka Mr. Perfect suffers his first televised loss via pinfall or submission, losing to Brutus Beefcake in a battle of future NWO members. Perfect’s cohort, Lanny Poffo has his unfortunate WM moment which involves Beefcake capturing him post match and cutting his hair. For Beefcake, this becomes the first time he gets to truly celebrate a win at WM. At WM3, he won a tag match only for his teammate to ditch him immediately after. At WM4, he had to settle for a DQ win over the WWF Intercontinental Heavyweight Champion, the Honky Tonk Man. Here, gets a clean win and gets to celebrate. Brutus will compete one last time at WM in 1993. Roddy Piper hails from Scotland, but he was born in Saskatchewan (go Roughriders). He brings the Canadian win-loss record to 2-0-1 with his double count out result against Bad News Brown. Of course this match is best known for Piper opting to go half-Roddy Piper, half-Al Jolsen which will be much criticized. On the plus side for the Great White North, still unbeaten so far. Improving the land of the Maple Leaf to 3-0-1 are the Hart Foundation, Bret Hart and Jim Neidhart as they score a quick win over the Bolsheviks. Needless to say, Nikolai Volkoff did better with the Iron Sheik as his partner than Boris Zhukov. As Summer rolls around, Volkoff will have a new take on life, falling in love with the United States and splitting apart from Zhukov. The Curse of the Executioner continues for Tito Santana as he suffers yet another WM loss, this time to the Barbarian, managed by Bobby Heenan. Santana drops to 1-5 at the biggest of big stages with his only win being over the masked Executioner (Buddy Rose, by the way) in the first ever WM match in 1985. For the Barbarian, his contract had been sold by Mr. Fuji to Heenan while the Warlord’s was sold to Slick, splitting up the Powers of Pain just months before the Legion of Doom could arrive. Randy Savage drops below .500 at WM, losing in a mixed tag match with Queen Sherri Martel to Dusty Rhodes and Sapphire, who have Miss Elizabeth at ringside as their manager. For Elizabeth, this was essentially a one-off agreement with the “American Dream.” The Savage saga will continue on, reaching an apex at next year’s WM. The Sapphire Saga meanwhile will run its course, coming to a downer of an end at SummerSlam. Shawn Michaels continues to come up short with his Rockers tag team partner Marty Jannetty on the big stage. Last year at WM, they lost to the Twin Towers. This year, their loss comes to a much smaller tag team, the Orient Express of Pat Tanaka and Akio Sato. The OE are managed by Mr. Fuji, becoming his team of choice upon splitting up the Powers of Pain. Canada is represented for one last match on this card and it’s by Dino Bravo who provides the only loss for the country, losing to Jim Duggan and putting Canada’s WM6 record at 3-1-1. Still, that’s not a bad record and all opponents were either American or Russian. …Yeah, Zhukov could count as either depending how you want to look at it. And yes, Volkoff was Croatian born, but here, he and Zhukov… definitely reppin’ the Soviet Union so I’ll just go with that. The WWF’s first non-sanctioned Championship match takes place next as Ted DiBiase puts his Million Dollar Championship up against Jake Roberts. While DiBiase retains by way of count out, Roberts still manages to add the “Million Dollar Man” post match to the DDT’d on PPV by Jake Roberts club, joining George Wells, Danny Davis, Hercules Hernandez, Rick Rude, and his bodyguard Virgil. DiBiase eventually comes to and decides to hang around ringside. A year earlier, the Twin Towers had helped bring about the Megapowers exploding. This year it’s their turn as the Big Bossman and Akeem have a bout against each other in a battle of former UWF World Heavyweight Champions. Before the match, DiBiase, himself a Mid-South product attacks Bossman, giving Akeem an early advantage. Bossman however still manages to beat his former partner in less than 2 minutes with the Bubba Slam. The next bout is between Superfly Snuka and Rick Rude. A year earlier, Snuka had marked his return to the WWF by saying hi at WM5. This year and next, he competes and loses. His loss next year is a bit more memorable, to a guy named Undertaker. For Rude, this is his last PPV win in the WWF. At SummerSlam he’ll challenge for the WWF Heavyweight title only to come up short, exiting soon after. That brings us to the main event. This is no ordinary main event. This is WWF Heavyweight Championship Vs. WWF Intercontinental Heavyweight Championship. Title Vs. Title, Hulk Hogan against the Ultimate Warrior. Some notable things about this match. To my knowledge, this match represents the only time Hogan ever challenges for the Intercontinental title as technically that’s what he was doing along with defending his own Championship. In a way, this was an unintended unification bout with the winner holding both Championships at the end of the match. Warrior’s WM record heading into this match was 1-1, a victory over Hernandez and a loss to Rude. Hogan’s WM record heading into this match was 4-0-1 with a tag team victory with Mr. T over Roddy Piper and Paul Orndorff and solo wins over King Kong Bundy, Andre, and Savage. His only blemish of sorts was a double DQ against Andre at WM4. For Hogan, this challenge was not like the others. With Bundy and Andre, Hogan could enact his super heavyweight strategy. With Savage, he could go back and forth and take Savage down the moment his second wind kicked in. The closest thing there had been to a crack in Hogan’s armor came from a rookie named Zeus Lister, who wasn’t savvy enough to capitalize on it. Another big difference is that in those previous showdowns, Hogan was clearly the fan favorite. This time, he was taking on a man who like himself fed off the crowd for energy and could make it work just as well. Fans may have been split, but were cheering just the same as both competitors did everything they could to get the advantage. 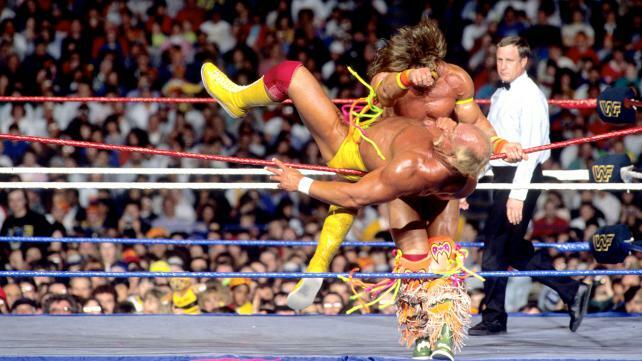 Hogan Vs. Warrior is a most epic match that lives up to the hype. Warrior also becomes the first man in the WWF since Hogan’s first WWF Heavyweight Championship victory back in 1984 to undo what I’d call Hogan Time. That’s when Hogan takes his opponent’s best shot and it brings him alive, leading to strikes, the big boot and/or bodyslam, and the atomic legdrop for the win. Warrior, whether he meant to winds up exploiting a key weakness to Hogan Time which is every ounce of energy, every fiber of being within Hogan, all weight focus, everything is going to the right leg for the atomic legdrop. When Warrior manages to roll out of the way of that legdrop, Hogan is screwed, unable to get up as his full body and soul effort just ate nothing but canvas, giving Warrior the opening to hit the running splash and score the pinfall win that sends the Skydome into an eruption of noise and emotion. Warrior retains his IC title and gains Hogan’s WWF title. Hogan drops to 0-1 as an Intercontinental title challenger, an overlooked bit of dubious history for the Hulkster. Warrior gets to have his moment. He’ll have another cool one at next year’s WM. As for Hogan, he’ll bounce back, but things won’t necessarily be the same. In the audience in the front row is Mary Tyler Moore. Also somewhere in the crowd is a young man named Adam Copeland, who will eventually enter the WWF as Edge. Steve Allen and Rona Barrett were part of the broadcast for people who dig that sort of thing. The Honky Tonk Man and Greg Valentine make a memorable appearance, arriving with guitars and a pink Cadillac. Valentine’s hair is dyed black and this period of his life will be relatively brief. Also of note, former AWA manager and future WCW World Heavyweight Champion Diamond Dallas Page quietly makes his WWF debut, driving the Cadillac before heading off to WCW to manage, commentate, and eventually try this whole in-ring competing thing. While Fuji can tout going undefeated at WM6, it was just one match and 1-0 is nice. Still, Bobby Heenan’s 2-1 mark at this event looks a little more impressive. Prior to the broadcast, Paul Roma defeated the Brooklyn Brawler, long since abandoned by Heenan. 1990 is quite possibly Roma’s best year in the World Wrestling Federation as he finally separated from Young Stallions teammate Jim Powers, he was getting some wins and later in the year he’ll form a tag team with Hercules Hernandez called Power & Glory, a team that won’t do too bad for itself until the Legion of Doom obliterate them at WM7. This show is basically part of the calm before the storm that is the Legion of Doom, consisting of Animal and Hawk. At the time of WM6, they were still the Road Warriors in WCW and finishing up business there, dealing with teams like the Dan Spivey & Mark Callous version of the Skyscrapers and also the Stan Lane & Bobby Eaton Midnight Express. Of course that Callous fella will debut in the WWF later in the year as Kane the Undertaker… soon shortened to just the Undertaker, but there will be a Kane, too someday. That’s much further down the road. For the Hart Foundation, it’s their 5th straight WM and only their 2nd where they get to compete in a standard tag match. At this point they’re 2-0 in that regard, but that’ll change with WM7. The Barbarian got to compete and win at WM6 while the Warlord didn’t get to compete at all. Advantage: Barbarian. For Piper, this is his first WM match since what was originally to be his career finale at WM3, a hair vs. hair match win over Adrian Adonis. There were 8 current and former World Heavyweight level Champions competing at this event, 9 by the end of the main event. Counting competitors and ringside, there are 11 total future members of WCW’s New World Order on this card. There are also 6 future members of the Dungeon of Doom involved. Beefcake and Bossman count for both. The Executioner Curse will continue on for Santana at the next two WM’s. Speaking of the next WM, Hogan will be challenging for and regaining the WWF Heavyweight Championship the following year. Also worth noting is the hype that begins for WM7 scheduled to take place at the Los Angeles Memorial Coliseum, home of the NFL’s Los Angeles Raiders and the Southern Cal Trojans football team. That will not come to pass with the event being moved to a much smaller Los Angeles Sports Arena, that venue’s first WWF PPV appearance since being part of WM2 in 1986. Finally, the Warrior holding both titles would last a short time with Warrior putting his full focus on the WWF Heavyweight title and handing the WWF Intercontinental Heavyweight title to President Jack Tunney, leading Tunney to put the title up for grabs in a tournament. Too bad it wasn’t a battle royale instead, because then Larry Zbyszko could show up and have a shot. Up next, WWF SummerSlam 1990 where the run of face painted perfection comes to a halt.